The building of the Tabernacle was a direct result of the building of the golden calf. After Aaron had given in to the request to build a god figure that the people could see, once Moses had disappeared into the top of the mountain and didn’t seem to be coming back, God had reluctantly realised that the people needed more than blind trust, more than simple faith – they needed something to hold on to. So, having attempted to build a god-figure that they could see, God moved them on to constructing a building for the God they could not see – and than of course gave the added twist that this building would not in fact be the dwelling place of God – if they built it said God, then God would dwell among THEM. The people were very busy building the mishkan. Though God had provided the blueprint, and had engaged the architect and builders so to speak in Bezalel and Ohaliav, the fact remained that there was a lot more to do, and we are told repeatedly in biblical narrative and in the midrash that ALL the people were involved – both in terms of giving to the mishkan and in terms of supervising or of being accountable to. The purpose of building the structure is a little ambiguous – clearly it was needed for the people to have some tangible and existing sign that God was among them, but the greater agenda seems to have been that not only did the people need a sense of the proximity of God, they needed too to feel the support of their companions. The building of the mishkan was in reality the way to build the community – its values, its processes, its vision. It also gave the people a much needed task – subsisting in the desert waiting to go into battle in some nebulous future cannot have been easy for them, and must have sapped morale and caused them to question the meaning of their existence. It is as if God responded to the anxiety of the people when they thought that Moses had gone and they were leaderless by giving them a commission to undertake – in effect God decided to keep the people busy, as they would then not get into the sort of trouble they did around the Golden Calf. Being busy meant they would also stop complaining – a habit they seemed to have polished into an art form already. So God gave them a task and they formed themselves into a committee and threw themselves into the job. When the mishkan was completed, and they were busy giving their accounts in sidra Pekudei, one commentator tells us that God said “Woe is Me, for now they will turn their attention away from creativity and working together, and once more lean towards destruction and separation.! The writer of that insight certainly understood how the Jewish community can behave – pulling together in times of crisis or shared values, bickering and pulling apart at other times. So, if the purpose of the building was really to create a way of behaving together, so as to build the people into a community, the end of the project must have been a critical time for the Israelites. I think that that is hinted at in the way the narrative develops, for the other major theme of Pekudei is the robes of the priesthood, and the mechanisms for developing that whole priestly structure, and this of course will lead us into the themes that will be preoccupying us over the next weeks of Torah readings – Vayikra, the book of Leviticus, is largely about the inner workings of the cohanim, the priestly leadership who will have responsibility for the worship of the people. But before we move on to the priesthood, let’s stay for a while with the twin theme of building and of community, what is known in the trade as minyan and binyan. We have always been a travelling people. We have built buildings and then left them behind. What is of prime importance to our people isn’t the place we live or worship in, but what we do in it, not the material structure but the structure of our community. That said, the space in which we come together as a community – our Beit Knesset, the house of meeting which also acts traditionally as Beit Midrash – house of study, and Beit Tefillah – house of prayer, is hugely important for us. It is the space in which we become a kehilla, the area where we function as part of the Jewish community. So while rabbinic priority is always on minyan – community, rather than binyan – building, and while we attach more importance to a group of people creating a cemetery and a school before they create a synagogue – and indeed why we teach that any clean and respectable room can function as a prayer hall – it doesn’t have be dedicated or specially consecrated to make it ‘holy’ – we do care very much for our religious buildings. There is a reason for this, and it can be traced to the building of the mishkan – we learn that how we create and treat sacred space is reflected in how we create and treat each other as people with whom we have a profound bond of covenant. While the mishkan was the dwelling place of God, it is no accident I think that modern Hebrew has taken the root word shachen and turned it into the word for the local community. In English we live in suburbs – places less than the more important city around which we are arranged, but in Hebrew we live in sh’chen’ut – in a neighbourhood, a place of community. There is a connection between our sacred space and our community – a connection so deep and intense that we can create one by creating the other. Sometimes we see this in the bonds we have with old synagogue buildings – it seems to me that every week there is a letter in the Jewish press about an old – sometimes even abandoned – synagogue needing to be saved for the community. Sometimes we see the connection in the processes – just as community was built as mishkan was built, so we generate our community and deepen it by involving ourselves in the continuing development of our shared building. This is an ongoing movement for us. Our building becomes emblematic of our inner belief system, it both shapes us and must be shaped by us. Sometimes that is difficult and we can get bogged down in detail – the sort of detail that Pekudei is also full of – how much money, how many hooks or nails, who paid for what, where the money went, who said it should…. That detail is important because it shows that all decisions made for the community must be transparent and open to all, it shows that no-one is above accounting for their actions, it shows too that leadership – in this case of the craftsmen Bezalel and Ohaliav – must be given to people who are capable and who understand more than just the details – Bezalel is described as having chochma, bina and da’at – not as being a chabad hasid, but as having wisdom, understanding and knowledge, in other words the widest possible sensitivity to information and how it is used. He must have been good at the details, but he was good too at the overall vision of what was to be created. And importantly, he helped the community come together in order to create both binyan and minyan. Sacred space is something that we all resonate with. And in parashat Terumah we have the beginnings of the first deliberately created sacred space. When Jacob recognised the awesomeness of the place where he had so blithely slept, he simply set up a pillar and offered a sacrifice of oil to the God he had just encountered. He moved on to Haran the next day, keeping with him the memory and the promise God had given him. He had no need to do more than mark the space for future use, but we need more – either because we have never had an encounter with the divine, or because we know that memory fades and we need a more concrete reminder of what God can be for us – we need to inhabit sacred space. In parashat Terumah God tells Moses to build a sacred space – a mikdash, a place that is in some way kadosh – separate, distinct and special, that embodies an idea and directs us towards it. From earliest times the commentators have pointed out that what the mikdash does NOT do is to embody God, or in any way be a place where God actually lives. The phrase that God uses “Assu li mikdash v’shachanti BETOCHAM” – let them make for me a mikdash, a sacred and separate space, and I will dwell AMONG THEM is key. The mikdash is the first building to be created for the awareness of God, it will be in the midst of the camp and will be a portable building that moves with the community, but it will be in the making of it – assu – that God dwells among us. Moses is told where and how to build the mikdash. There are chapters and chapters of detail as to how to build it, with what materials, what colours shapes and sizes, how much everything weighs and costs, where it is to be placed. But all of that is secondary – God’s presence isn’t in the building, but in the people working to create it. The presence of God is something that occurs only when people are actually doing something to bring it about. 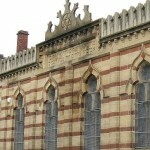 The synagogue I grew up in, the Bradford Synagogue was the third Reform synagogue in this country and is the second oldest building (Manchester having lost its original synagogue in Park Place). The quotation at the top of the extraordinarily decorated exterior comes from a young Jacob who had just encountered God in a very ordinary place, “Ma Norah HaMakom hazeh. Eyn zeh ki im beit Elohim, v’zeh sha’ar hashamayim. ‘How full of awe is this place! 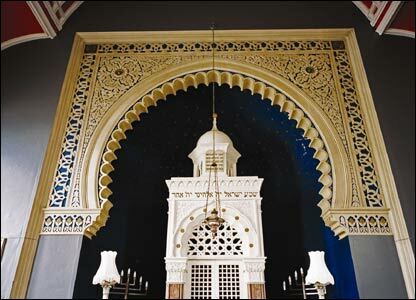 this is none other than the house of God, and this is the gate of heaven” was one that seemed to fit the grandeur of the Moorish Architecture of this beautiful building which was built in 1880 as the Bradford Synagogue for British and Foreign Jews. It was and is an amazing building, with vaulted ceilings and a free standing domed ark with grille-work to the front standing within a huge niche which is painted a midnight blue, and golden stars shine behind it, so that as a child it was easy to imagine being in a different and exotic world. Added to that the rich scarlet of the bimah coverings and the Persian carpets covering the raised area by the ark meant that truly it was (and is) a place filled with awe.. It was an awesome place and a place where heaven and earth met because of the community which met within it, which educated its children and celebrated the festivals and fasts of Jewish time. It was a community always small enough for every single person to matter, for everyone to have to be involved if it would survive. That Synagogue is proof that it isn’t really the building that creates a sense of God, however gorgeous and ornate it might be – it is the people who come to work within it, the ordinary people who in daily life might work in retail or wholesale, be dentists or doctors, teachers or journalists. Each of them, with willing heart, brought what they had to create a community. The whole key is in that verb – assu. We have to be doing, to making, to be forming and creating the whole time, not resting on our laurels in beautiful places, not turning places into museums of sacred space. Jacob had the right idea when having acknowledged the power of the encounter with the words “Ma Norah HaMakom hazeh. Eyn zeh ki im beit Elohim, v’zeh sha’ar hashamayim. ‘How full of awe is this place! this is none other than the house of God, and this is the gate of heaven.‘ – he then he marked the place and moved on. Sacred space is only sacred if we keep adding to its kedushah by being ourselves people who are kedoshim – people who follow the sacred principles and try to be more like God in our behaviour.